Ballymena United goalkeeper Dwayne Nelson announces details of his forthcoming testimonial match against a Glasgow Rangers XI with former Ibrox midfielder Ian Durrant, who will manage the Rangers side. Also included are United officials Ronnie McDowell, Davy Douglas and Alan Francey. 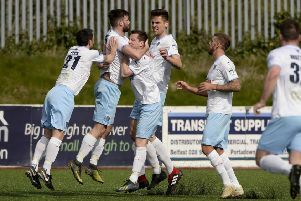 Tickets go on sale this Wednesday, June 17, for Ballymena United goalkeeper Dwayne Nelson’s testimonial match next month. The Sky Blues will take on a Glasgow Rangers XI - managed by former Ibrox legend Ian Durrant - at the Showgrounds on Tuesday, July 21. Tickets priced at £10 (£5 concessions) are available from Stirling Trophies, Queen Street or the Kiosk newsagency at Ballymena railway station. Alternatively, tickets for the match are available from any locally-based Glasgow Rangers Supporters’ Club.